The FT-MS Facility of the Woods Hole Oceanographic Institution was established in October 2007 with funding from the National Science Foundation, the Gordon and Betty Moore Foundation, and the WHOI Director of Research. We offer fee-based services to support research in marine and terrestrial biogeochemistry, atmospheric chemistry, and biology. Since its inception, the WHOI FT-MS facility has enabled a suite of investigations into the chemical composition of seawater and freshwater dissolved organic matter, of atmospheric particles, and of biological mixtures. Fourier-transform ion cyclotron resonance mass spectrometer: After 11 good years, we are retiring this instrument from the facility in 2019. Instead, we offer the Orbitrap Fusion Lumos. Orbitrap Fusion Lumos: Coupled to an ultra-performance liquid chromatography (UPLC) system, the Fusion Lumos tribrid mass spectrometer provides ultrahigh resolution and high mass accuracy and tandem MS options for molecular identification. The FT-MS facility welcomes WHOI internal users as well as all outside scientists for sample analysis. For more information about the FT-MS facility please send inquiries to the facility manager. Metabolomics is a technique that seeks to measure all of the small organic molecules produced by cells. Because these small molecules are the end-products of multiple levels of metabolic regulation, their concentrations provide a temporal snapshot of the metabolic state or phenotype of an organism at that moment. Metabolomics is a rapidly expanding field that has, until recently, predominantly focused on characterizing human metabolic profiles for biomarkers of disease, but is now expanding to a wide range of organisms and environments. In the oceans, metabolomics is still in its infancy. 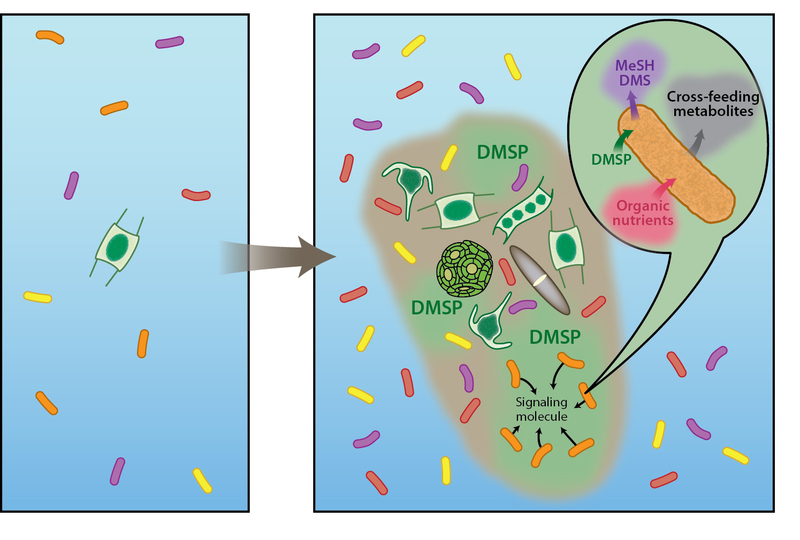 The WHOI FT-MS facility and the Kujawinski laboratory have collaborated to develop metabolomics methods that are appropriate for marine systems. These include targeted metabolomics for metabolite quantification and untargeted metabolomics for compound discovery. We offer services for sample analysis, data analysis, and new method development for specific targeted analytes. Please inquire with the facility manager for more information about this capability. 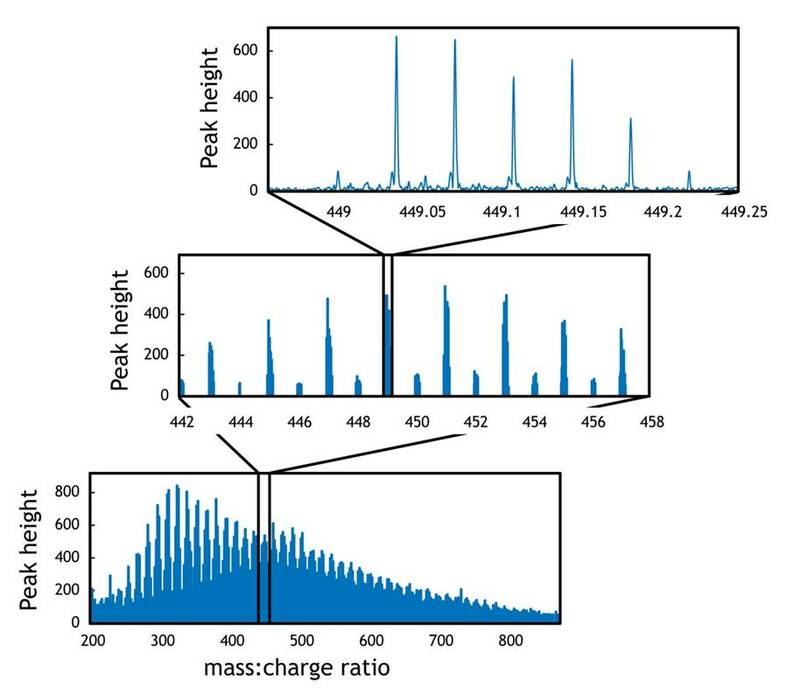 Example of ultrahigh resolution mass spectral data.